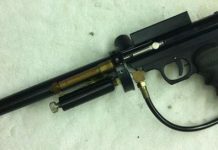 Rick and I look at a Lapco AutoSpirit that Rick has just finished restoring. The serial is stamped under the shroud. 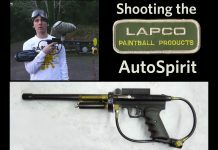 A shooting video of the Lapco AutoSpirit semi automatic Nelson based paintgun that I recorded back in 2012. 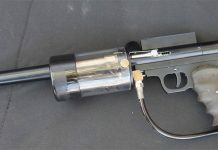 The Lapco Autospirit was likely built in 1994. A Lapco autospirit which is actually pretty fun to shoot.